Old school wine pairing rules dictate that white wines go with white meat, red wines with red meat and that's all there is to it. Yet by all accounts, salmon steaks, filets, and patties are pretty pink. What's the wine pairing protocol for "pink" meat? Pink wine? Well... yes, that's a solid starting point for pairing with salmon, but salmon's popularity and recipe versatility call for a full spectrum of wines on the white wine, red wine, and rosé wine fronts. 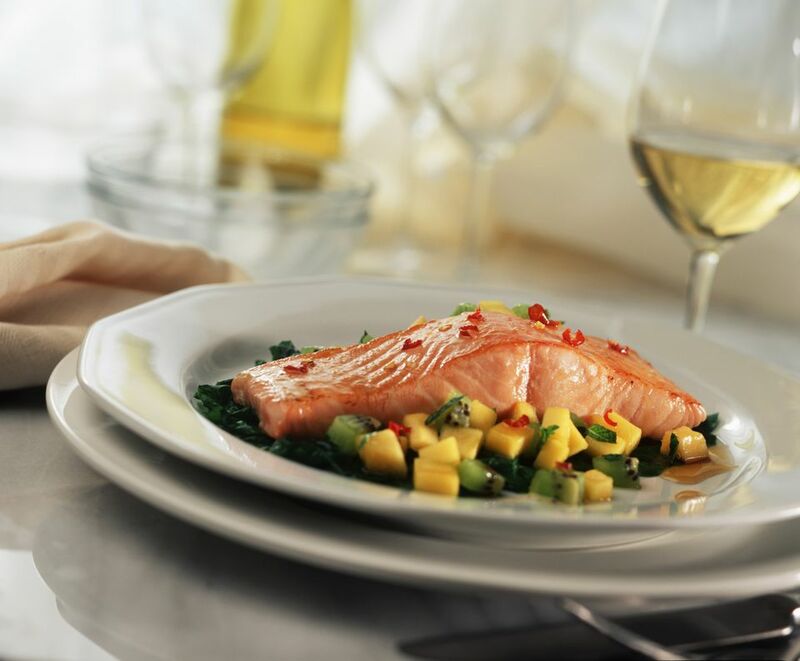 When it comes to pairing salmon with wine, the fatty fish, and the final sauce or influential seasonings must be considered together. The spice flavors, overall textures, and preparation styles all convene in a savory synergy to dictate the best wine selection for the salmon recipe at hand, it's not simply the fish alone to be considered for optimal pairings. While rosé wines tend to be a no-brainer for many salmon dishes, from grilled to smoked and poached to paté, the medley of red fruit, dry, mineral driven character and typically acute acidity in rosé wines make for an exceptionally accommodating salmon pairing partner. In fact, rosés maintain a popular pairing position for their ability to mimic the strengths found in both red and white wine profiles. Taking the rosé wine theme and adding some serious bubbles in the form of a brut rosé Champagne or sparkling wine promises to elevate the elegance factor while the bright acidity cuts through the rich, oily layers of the fish allowing unique preparation styles, spices, and seasonings to shine through the palate structure. When it comes to smoked salmon and crème fraîche, poached salmon, or a salmon paté crostini, the subtle red fruit, yeasty aromas, and food-friendly acidity of a well-built brut rosé sparkling wine promises to come dressed to impress a wide variety of palate preferences. Need a few Rosé wine recommendations to get you started? Catch a sampling of a brut rosé sparkling wines. Hands-down the number one red wine pick for salmon is Pinot Noir. The silky, subtle tannin structure, strawberry and raspberry fruit character, along with the often earthy undertones of Pinot Noir bring out the savory flavors in herb-crusted salmon recipes or cedar plank grilled salmon. Beaujolais, Grenache, or a Zinfandel (especially with blackened salmon set up) are among top red wine picks for pairing with the smoky notes of grilled or pan-seared salmon. Basic baked salmon will also find a friend in Pinot Noir. White wines tend to be a bit more forgiving on the salmon pairing front and are quite capable of handling a variety of sauces and seasonings that often debut with popular salmon dishes. If the salmon recipe at hand leans heavily on fresh herbs like dill or steers towards clean citrus flavor tones, then Sauvignon Blanc's crisp minerality, herbaceous notes, and citrus flavors promise a tasty tandem. If butter or cream sauces to highlight the fish, then veer towards a rich Chardonnay that has seen a bit of oak or shake it up and opt for the varietal depth and crisp character found in a Loire Valley Sancerre. The fuller body of the oaked Chardonnay, white Burgundy, or Sancerre will match the weight and mouthfeel of the fish, taking the pairing beyond flavors to textures. The off-dry style of many German Rieslings partner up well with the more subtle flavors of poached salmon dishes as well as bringing out the best in salmon wrapped up in spicy sushi themes, while the medium-bodied, floral aromas and apple character of Pinot Gris from either Oregon or Alsace show remarkable resilience with salmon prepared in a range of recipes. Gingered, brown sugar or maple marinades with a touch of garlic and the yin and yang of sweet and savory call for the exotic aromas and often the off-dry style of Gewurztraminer. Whether it's a white, red, or rosé wine that ends up partnering with a favorite salmon dish, by viewing the recipe as a whole, considering the dominant seasonings, accompanying sauce, and cooking methods when deciding on which wine to pour, you'll be well on your way to experimenting with the best salmon pairing for your particular plate and palate. How Do You Pair Dessert With Wine and Cheese?